Chum salmon in two stages of their life. The ‘silverbright’ would be caught out at sea. The striped ‘dog salmon’ would be closer to spawning grounds. “Record numbers of chum salmon — two million fish — returned to B.C’s West Coast this year, bringing good news for fishermen fatigued by word of record lows of Fraser River sockeye. “We’ve had significant abundances … it’s all good news,” said Jennifer Nener, Fisheries and Oceans Canada’s regional salmon director, earlier this week. That news got even better with the Johnstone Strait haul hitting 1.3 million fish. 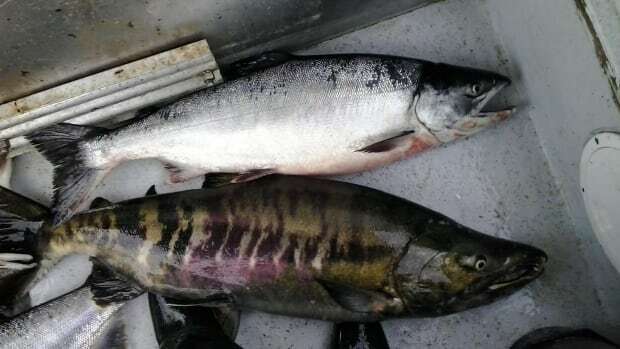 “Fraser River chum salmon return is estimated to be two million, the largest return on record,” said Lara Sloan of Fisheries and Oceans Canada in an email to CBC Friday. Sloan said the spawning target was met early, with a total catch estimated at 150,000. Chum catches have been strong on the east coast of Vancouver Island also, but she said not all the data is in yet. Gillnetter Shaun Strobel fishes the west coast of Vancouver Island, and down the Johnstone Strait to Nanaimo.